Back in 1988 I was having a particularly tough time at work- no details, but let's just say a man was trying to make my life miserable and I needed a mental health day. I decided to go to a movie that had just been released, Working Girl. After all, Harrison Ford was in it! I thought it would be a fun chick flick and bring my spirits up. I was right. My spirits saw the underdog, a woman no less, rise above the BS and succeed, or at least get her opportunity to succeed. So, what is my point? Do you remember that scene at the very end when Melanie Griffith, er Tess McGill in Working Girl combines Trask and radio to succeed? It was almost like an Oprah AHA moment! Well, I had an AHA, or Trask/radio idea! Chili and Grilled Cheese. You eat cheese on your chili don't you? 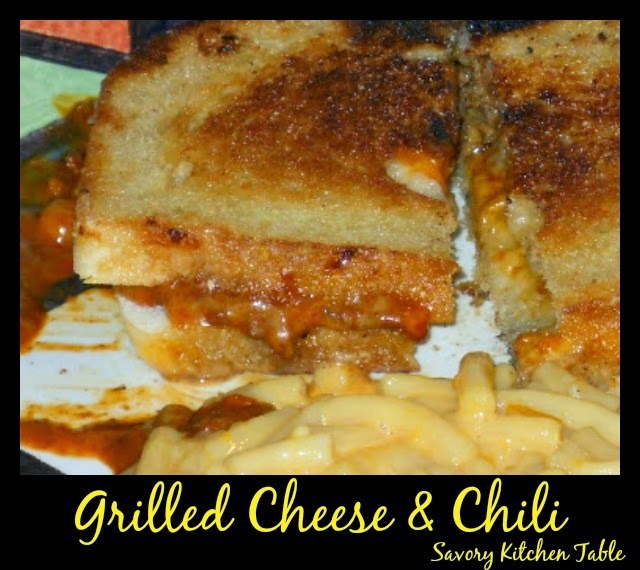 So, why not eat chili on your cheese, grilled cheese that is. There's no real recipe here - you get the picture!